I’m Charlie Nardozzi and this is the Vermont Garden Journal. It’s one of the earliest plants domesticated by man and is grown around the world. We use it for a multitude of purposes, except eating. What is it? It’s the gourd. Ornamental gourds originated in Asia thousands of years ago and have spread around the world. There are two types of this cucumber-family plant that are commonly grown; the decorative, or soft-shelled gourd and the larger, hard-shelled gourd. The soft-shelled gourds are those warty, odd-looking, colorful small gourds you see used as fall decorations. They usually rot after a good frost and are composted. 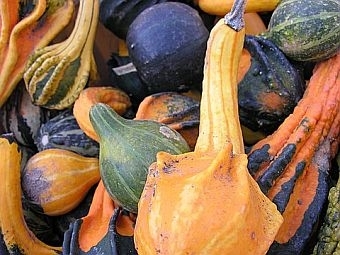 The hard-shelled gourds are the ones used since ancient times. Many hard shelled gourds are named after their usage such as dipper gourd, spoon gourd, bottle gourd, basket gourd, and birdhouse gourd. Some cultures make musical instruments from their gourds. Once cured, these hard-shelled gourds can last years. I still have a bottle gourd I grew for my step-son 20 years ago. The key to preserving the hard-shelled gourds is to cure and dry them properly. Gourds take a long time to mature, so be patient. Harvest once the gourd has reached full size, but before a frost. Wash off the shell with a soapy water solution to disinfect the gourd. Place it in a warm, well-ventilated, dark room for drying. The skin should dry within 1 week, while the insides of the gourd may take several months. Don’t let the gourds touch one another and check them daily for rotting. When you can shake the gourd and you hear the seeds rattle around inside, it’s dry. Paint, carve, wax and decorate the gourd as you desire. Now for this week’s tip, it’s time to plant garlic. Build a raised bed, amend it with compost, and plant garlic cloves 6 inches apart in rows on top of the bed. Come November, cover the bed with a 4- to 6-inch thick layer of straw or hay to protect the cloves in winter. Next week on the Vermont Garden Journal, I’ll be talking about ornamental grasses. For now, I’ll be seeing you in the garden!